Writer JODY ROSEN, and photographer ANDREW ROWAT have published a three-page story with accompanying pictures in the March/2013 issue of the New York Times ‘Style Magazine’. This kind of publicity you can’t buy – especially if you’re running a smallish bookshop several kilometres from the centre of TORONTO. 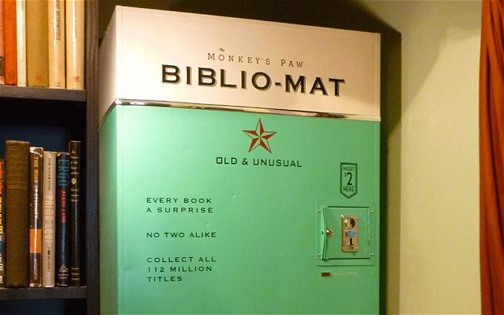 The article focuses on The Monkey’s Paw, “an oddly modern antiquarian bookshop next door to a laundromat” in the West End. “It’s a tiny shop, specializing in the arcane and the absurd, and may just be publishing’s great new hope” in the face of BigBoxMerchandising and the internet. During her visit, Ms. Rosen checked out the BIBLIO-MAT, which has been photographed countless times. It’s Mr. Fowler’s experiment in randomization. You put a $2 coin into the slot, there’s a buzzing sound, a bell rings and out pops a book. The idea being that even the cheapest book can offer pleasure. 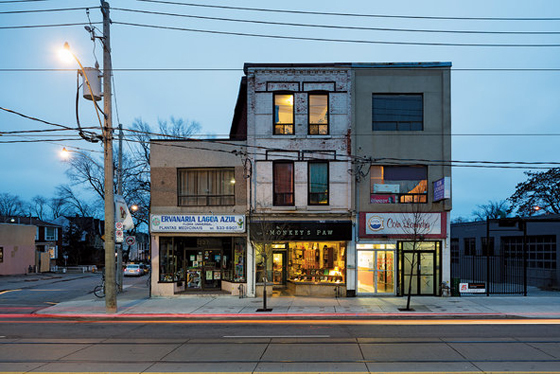 You’ll find The Monkey’s Paw at 1229 Dundas Street West, one of several independent bookshops in our city – miraculously still doing business. This entry was posted in Culture, What's On & Entertainment and tagged Canada, New York Times, Ontario, The Monkeys Paw in Style Magazine, Toronto, Toronto antiquarian bookshop. Bookmark the permalink.